An engineer’s error can cause enormous damages or even casualties and be downright disastrous when it comes to space applications. Even advanced space projects like Hubble, Proton-M and Curiosity were not immune to errors. Was there a chance to prevent the failures? What knowledge and skills can raise a space engineer’s awareness of the high complexity and cost of the space program they are working on? To get answers to these questions, join the lecture by Anton Rogachev of the Skolkovo Institute of Science and Technology. If you dream of becoming a space engineer and building a space elevator or a manned space base on other planets, the lecture will be an enjoyable and enlightening experience where you will learn about engineering competitions and the steps you should take now to get prepared for thrilling space projects of the future. 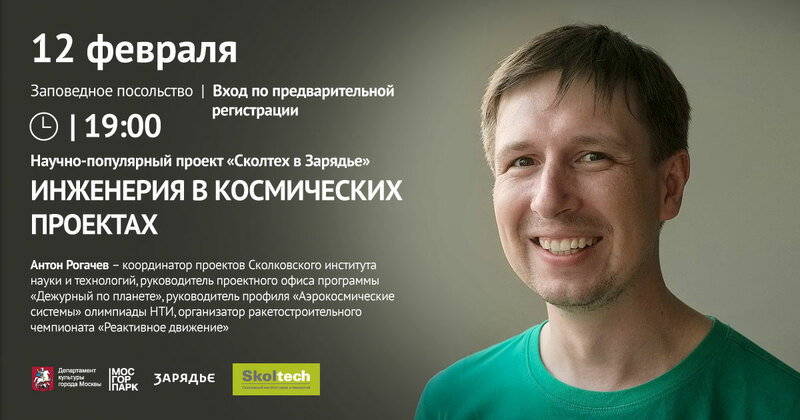 The lecture will be given in Russian at Zaryadye Park Lecture Center on February 12, 2019 at 7 p.m.
Project Coordinator at the Skolkovo Institute of Science and Technology; Head of the Project Office, Planet Watch; Head of Aerospace Systems, NTI Olympiad; organizer of the Jet Propulsion rocket science competition; Member of the Expert Committee of the Russian National School Olympiad (Technology). Anton Rogachev graduated from the Physics Department of M.V. Lomonosov Moscow State University and worked as project lead at Rambler Internet Holding, Informika, Megafon, and Promsvyazbank.